As usual, the Walters’ Kitchen has been in full blaze this holiday season. My good friend Angel came over for Thanksgiving and helped me cook. We had such a great time! 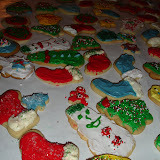 Then my girls on my missions team to KENYA came over and we baked upwards of 200 cookies!! Icing and all. The best part is that once we finished we rolled down to the local fire house and gave the guys (and girl) some christmas cookies!! Firemen are so Christmasy with all their decorations etc we knew we would be welcome, even if it was 11:00 pm!! !